When Magnolia Street was threatened, they called in the army. Literally. A century of erosion and increasing instability of Hickman Bluff threatened to undermine the street, public buildings and, eventually, the public water supply of Hickman, Kentucky. Then the U.S. Army Corps of Engineers was called in to save the day. 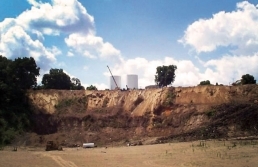 The resulting stabilization project used an innovative soil-nailing and shotcrete facing technology to reinforce and stabilize the bluff. The soil nails provided an anchor for a shotcrete facing to the bluff. Shotcrete is concrete pumped through a hose and blasted at high velocity onto a surface. It undergoes placement and compaction at the same time due to the force with which it is projected from the nozzle. In this case, the soil nails were epoxy-coated 45-foot-long reinforcing bars. Soil nails were installed in a pattern designed to ensure both the internal and external stability of the bluff wall. Other features of the project included surface and sub-surface drainage systems to eliminate instability caused by surface and groundwater movement; 26 deep anchors, each 233 feet in length; and a shotcrete reaction beam that supports the load of the reconstructed corner of the bluff above. The corner of the bluff was reconstructed using a lightweight aggregate fill reinforced with geogrid and faced with limestone riprap. It’s one of many projects we were happy to support.